On Monday, President Donald Trump celebrated Martin Luther King, Jr. Day by visiting the African-American civil rights icon’s memorial in Washington, D.C. – for two minutes. 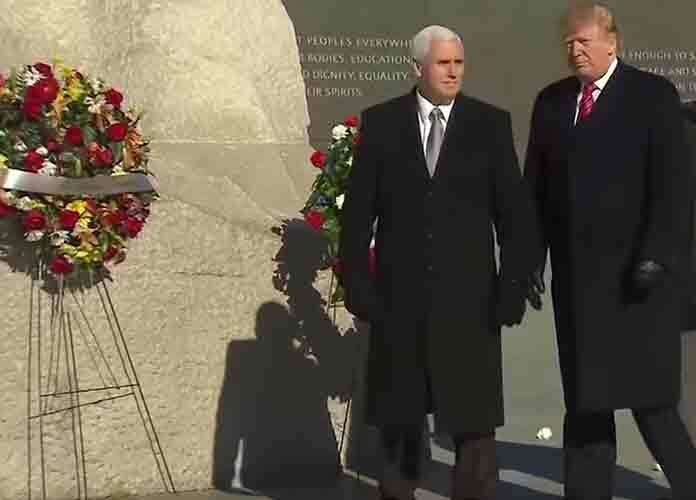 Vice President Mike Pence and acting Interior Secretary David Bernhardt also visited the memorial and laid a wreath at its base. The president reportedly did not announce he would visit the memorial, and was heavily criticized for not spending more time at the landmark and for not honoring the holiday in other ways. Trump also refused to answer questions about the partial government shutdown, which on Tuesday entered its 32nd day. Pence also drew mockery when he compared Trump to King, the first president of the Southern Christian Leadership Conference who was assassinated by James Earl Ray on April 4, 1968 at age 39. King was born on Jan. 15, 1929. On Sunday, just one day before MLK Day, the vice president made what Colbert sarcastically called a “tasteful comparison” between Trump and King during an interview on CBS’s Face the Nation. Colbert’s audience groaned and booed after hearing the clip, and the comedian retorted: “Mike, are you sure you want us to judge Trump on the content of his character? He puts a lot of effort into the color of his skin, whatever that really is. Uncooked calamari?” Colbert added as the audience cheered and applauded. The late-night host went on to subtly blast Trump for his border wall proposal, and brought up a quote from King regarding the Berlin Wall, which he saw when he visited East Germany in September 1964. “For here on either side of the wall are God’s children and no man-made barrier can obliterate that fact,” King said at the time.